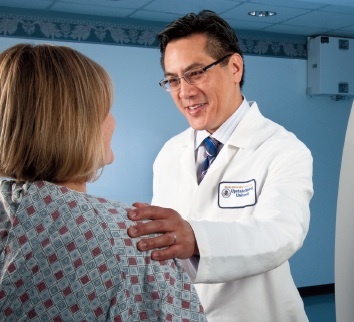 Lawrence Chin MD, Upstate’s new neurosurgery department chairman, is perfecting minimally-invasive methods of taking care of a variety of neurological problems, including tumor removals, spine malformations, blood vessel abnormalities and trauma. His interview on Health Link on Air radio airs at 9 a.m. Sunday, Oct. 20. One example of care Dr. Chin now provides to Upstate patients is a new technique for treating spinal stenosis, a narrowing of the area around the nerves in the spine. Spinal stenosis is one of the most common problems to develop as we age, causing back pain, leg pain and sometimes difficulty with walking. “I developed a technique for approaching the spine without disturbing any of the muscle surrounding the spine, so this really reduces post-operative pain. After the surgery patients have very little pain and therefore don’t require much pain medication,” Chin says. “They can get up right away and move around. Hear Dr. Chin’s radio interview on Health Link on Air. Learn more about Dr. Chin. Read his abstract about spinal stenosis treatment in the journal, Neurosurgery. This entry was posted in brain/spine/neurosurgery, community, health care, HealthLink on Air, surgery and tagged academic medical center, health care blog, health care social media, hospital blog, hospital social media, medical blog, SUNY, syracuse health care, syracuse hospital, university hospital, upstate medical, upstate university. Bookmark the permalink.